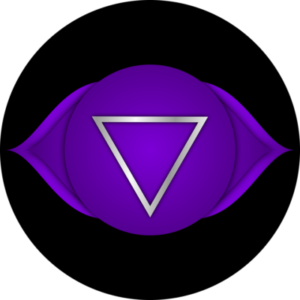 The third eye chakra is located at the center of the head between your eyebrows, and it is associated with our intuition and inner vision. It is from here that we experience our ‘sixth sense’. The third eye chakra is your own personal movie screen. It is where we see our dreams at night, where we recall memories, where we see images, colors, insights. It is our mind’s eye and if we don’t pay attention to our perception we can miss out on benefiting from the messages our intuition has to offer. When you are balanced you are able to see clearly what you want in your life.You are in touch with your intuition and trust what you receive. You may have some insightful abilities or what we call a ‘sixth sense’. You have a great memory and remember details. When your third eye is over active you can tend to have nightmares and find yourself drifting in the cosmos.You may fantasize or have hallucinations and find it difficult being grounded. When it is under active you will have a poor memory and wont be able to remember your dreams.You will find it difficult to visualize with your mind and not be able to tap into any intuitive feelings. Here are just 3 simple tips to help you improve the energy balance in your third eye chakra. 1.Commit to a regular practice to improve your intuition with things like meditation, guided visualization, dream work, visions boards or even come try one of our Chakradance classes. 2. Regularly ask your intuitive higher self for advice and be open to listening for those answers. 3. Recognize chance encounters, synchronicity’s and co-incidences that show up in your life as signs guiding you.